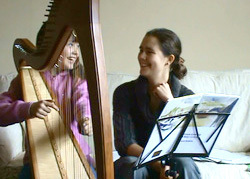 I have been teaching harp professionally for nearly 10 years. I started teaching during my degree and then moved on to attain a Certificate of Teaching with the Associate Board of the Royal School of Music. I also encourage my students to attend my harp ensemble class where we have fun learning in an informal and sociable setting. We hold master-classes, have other professional musicians to share their expertise, go on trips, play and perform ensemble pieces, study improvisation, and enjoy a full musical experience. The group meets in Carmarthen every 6 weeks of so, and anyone learning the harp is welcome to join.